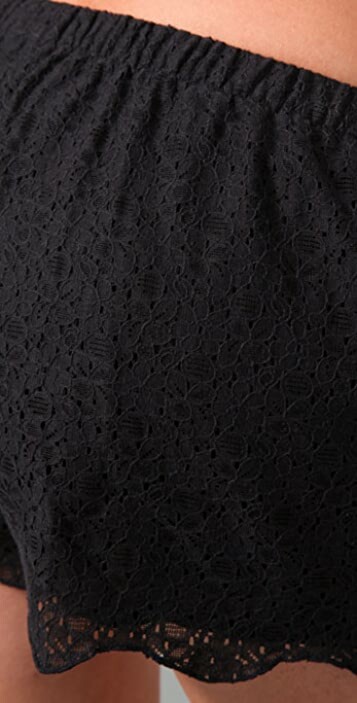 These lace shorts feature a scalloped hem and a gathered elastic waistband. On-seam hip pockets. Silk lining. * 10" rise. 3" inseam. * Shell: 70% cotton/30% nylon. They are not too small or too large, but the layer under the lace rides up making them look like pajamas. Bought these in black but I wasn't really sure what to wear with them. I paired them with some black tights and a silk tank that I tucked in. What a cute outfit. I bought the small, and they fit me, but Im about a 4-6. I thought a small would be wayy to small but they fit great. Cant wait to wear these in the spring too! Yet, for all their awesomeness they were far too big! I ordered them in black and based on another review i sized up to a medium. BIG MISTAKE! They looked like a pair of bloomers on me. I thought they'd be tight around my thighs and cut into my waist but the legs were huge and the elastic is wide enough to not dig in (if you are worried about that though you could wear Spanx with them). Look at the Madewell size chart on their website, its probably spot on considering i'm a size 4 (i'm 34/25/37) which meant I should have ordered small. Otherwise, the quality, material and cut were good. They're meant to look relaxed, not mammoth. Sadly, they didn't get to come to the party with me. The color is beautiful, but against my bare skin it kind of looks like I'm naked! The quality and fit also weren't great. I'm normally a 0/XS, but the XS in these were a bit too snug. When I tried them on with tights underneath, the lining sort of stuck underneath the lace fabric, which was annoying. I was thinking about returning them for a bigger size, but now I think I'm just going to return them altogether.